Prep and Cook Time: about 40 minutes, plus at least 30 minutes to chill. 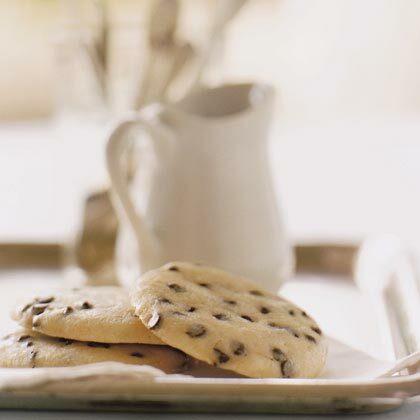 Notes: Store these crisp mint-chocolate chip cookies airtight at room temperature for up to 3 days. In a bowl, with an electric mixer on high speed, beat butter, powdered sugar, peppermint extract, and vanilla until smooth. Beat in egg whites until well blended, scraping down sides of bowl as needed. Stir or beat in flour, salt, and chocolate chips. Cover bowl with plastic wrap and chill until dough is firm but still pliable, about 30 minutes. With powdered sugar-dusted hands, shape dough into 1 1/2-inch balls, flattening each slightly between your palms to about 2 1/4 inches wide. Place 1 inch apart on buttered or cooking parchment-lined 12- by 15-inch baking sheets. Bake in a 300° oven until cookies feel firm to touch and are barely beginning to turn golden on the edges, 10 to 12 minutes; if baking more than one pan at a time, switch pan positions halfway through baking. With a wide spatula, transfer cookies to racks to cool completely.